This 75 foot slope looks steep and scary, but this is what we work on and this is why we wrote our publication. Safe Harbor uses natural systems to stabilize steep, very steep slopes and eroding coastal bluffs. We have developed innovative techniques (low impact, low profile, low maintenance and low cost) to re-establish PERFORMANCE OF stability, STORM WATER MANAGEMENT AND HABITAT. Click on the link below if you want a copy of our publication, revised, 2015. Safe Harbor Environmental Education Publications are free. Site specificity will play a role in developing alternatives analysis for specific project locations. Our principles and strategies are transferable from site to site but techniques and materials need to be site appropriate. Succesional biomass platforms need to be created. Over time, these will provide linkage to scale with adjacent habitat systems. We have found that "jumping" successional stages produces cost heavy, materials heavy and maintenance heavy projects with unnecessary survivability risks. 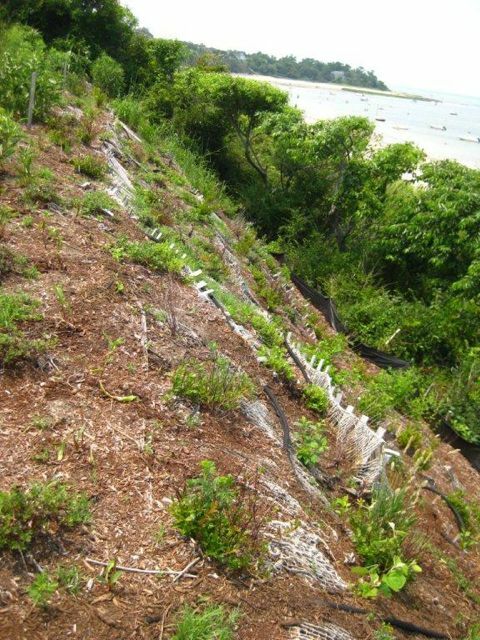 On Cape Cod, we have successfully used steep slope stabilization principles for sand/soil mix slopes of nearly 80 feet high. The Cape's slopes often reflect glacial compression of soil materials rather than the expected angle of repose for compositional materials. Natural vegetation normally stabilize slopes. Lack of the root/stem/leaf surface system, due to anthropogenic or other causes, reduces stability and creates exponential wind/water erosion risks, not to mention secondary impacts from eventual deposition. Safe Harbor advocates "reverse terracing" or "in slope benching" to provide temporary retention and infiltration mitigation pending sustainable performance of the native vegetation system (usually 3 years). The key to solving erosion issues is controlling the speed and infiltration of storm water. The camera angle misrepresents the steepness here. Several thousand pounds of storm water have left its mark on the slope. Layering natural materials creates a bio-engineered microorganism and nutrient system for indigenous vegetation. First year growth performs at nearly zero discharge. It may include a few invasives but we keep them for soil stabilization, cutting the stems before they seed. Second year vegetation has already been subjected to drought conditions but now contributes performance values for habitat and zero discharge. A natural system solution should always be considered. Engineered structures may require higher financial commitments, with installation requiring mitigation and structures requiring maintenance. We believe the key to solving many environmental problems may often be found within the problem itself. Our natural, steep slope stabilization system incorporates storm water management, erosion control and revegetation. This system redirects gravitational energy towards a solution capable of maintaining zero discharge erformance standards. Indigenous stabilization systems protect habitat value, are inherently low impact, low cost, low profile and low maintenance. These are some recommendations to consider when designing your own system. Creating properly spaced and designed terraces or benches, decreases storm water speed and enhances infiltration. 1. Assessment: study the dysfunctional existing dynamics of hydrology and habitat. 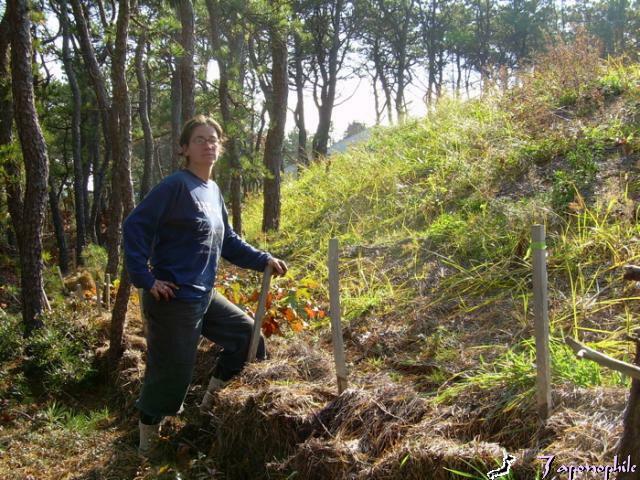 All contributing causes and impacts of slope erosion should be studied. Focus on identifying primary cause dynamics. Study adjacent, performing areas. 2. Remove Contributing Flow: remove upslope sheet flow and point source contributions before they reach the slope crest. Use standard, low profile, low impact, groundwater infiltration systems such as swales or dry wells or drip lines. Ideally, these systems should remain 30-40' behind the crest. 3. Get Measurements: measure from the crest to the foot of the slope and calculate the slope angle. In cases of expansive slopes, work areas should be divided into 100 feet wide by 50 feet deep sections. 4. Control Perpendicular Access: we recommend using extension ladders to accommodate slope access. Perpendicular foot traffic creates impacts, which are avoidable. Extension ladders can usually accommodate 40-50 foot slopes. The ladders can be staked to prevent sliding and joined together to create more length. 5. Create Horizontal Infiltration Terraces: using your boots or a shovel, create infiltration terraces about a foot wide. These small, horizontal line terraces should be inclined, to lean back into or cant, into the slope. This component will slow down, hold and infiltrate storm water. For 30 degree slopes, the infiltration lines can be spaced 8 or 10 feet apart. A 45-degree slope can accommodate infiltration lines 6 or 8 feet apart. For 60-degree slopes, the infiltration lines will need to be 4 or 5 feet apart. Variable percolation rates affect performance and should also determine spacing. 6. Work From the Terraces Only: avoid destabilizing the slopes. Use ladders, terraces and always lean into the hillside when moving. 7. Apply Indigenous Compost: indigenous compost (fully decomposed indigenous plant material) is thinly spread across the slope and gently raked into the hillside. Layers of two to three inches are all that will be necessary to create welcoming habitat for windblown seeds and indigenous plants. Use locally available compost. 8. Avoid Excess Compost: more is not better. Excessive compost is prone to erosion and invites invasive and exotic vegetation, which cannot contribute to sustainable habitat. 9. Apply Indigenous Mulch: a thin, one-inch layer of locally available mulch (semi-composted, indigenous plant material, including some twigs) should be spread over the compost layer. Mulch straw, not hay, could also contribute to this layer. This contributes to microorganism and insect biodiversity as well as providing a layer of root protection from extremes of temperature and moisture. Materials can be moved in 5 gallon buckets. 10. Use Pre Cut Jute Netting: Jute netting should be used in pre cut sections of 20 or 30 feet. To avoid destabilizing the bio-engineered surface layers, 2 person installation teams should be used. Install the upper netting edges along the outer edge of each infiltration terrace. The netting contributes to soil structure and provides a stabilizing grid for seed capture. 11. Secure the Netting: Use ground staples to secure the top and bottom edges. Install staples on the vertical plane, not perpendicular to the slope, at 4 foot offset centers. 12. Conservation Mix Seeding: sow locally appropriate Conservation Mix seed into the net/mulch/compost. The root/stem systems will begin contributing to sustainable stabilization. 13. Do Not Overseed: more is not better and will result in nutrient depletion from over competition. This seed mix is only intended as an initial stabilizer. Thick grass performs poorly by encouraging runoff. 14. Use Indigenous Top Cover: lightly spread a top covering of indigenous leaves, grass, evergreen needles or new straw across the netting. Target 40-80 per cent slope coverage. Study adjacent stabilized slopes to determine composition. The netting will help to hold the top cover. 15. No Not Overload Top Cover: top cover protects survivability by providing additional thermal and moisture stability. Over covering blocks sunlight and may redirect rainwater. 16. 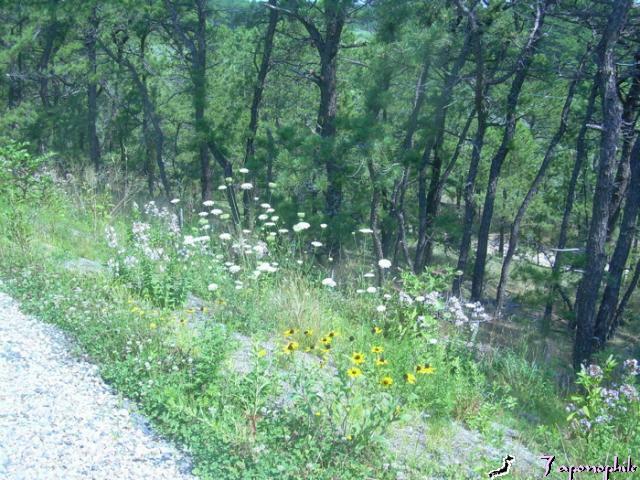 Plantings: growing season specifics and adjacent habitat mix should guide plantings. Transplants have 50% survivability. Fruiting vegetation planted upslope encourages down slope reseeding. 17. Limited Watering: during the first growing season, limited watering may be necessary in times of drought, to support survivability. Once indigenous growth has been established, drought will be a factor in selecting sustainable vegetation. Hand or sprayer watering is less efficient than drip hose irrigation. Watering should take place in the morning to avoid mid day thermal shock. 18. Chemical Use: limited use of slow release, 5-5-5 fertilizer should be restricted to early and mid growing season only. Over nitrifying soil layers produces insect attracting vegetation and invites invasives that can destabilize habitat values. We do not normally use fertilizers and never use pesticides or herbicides. 19. Biodiversity and Micro Habitats: inexact consistency in applying slope layers and lumpy, articulated surfaces should be expected. These features create microhabitats, which contribute to plant biodiversity. On site biomass, in the form of downed tree limbs and branches can be left to contribute to slope structure and habitat diversity. 20. Sustainable Vegetation: raw slopes need three years to regain value as habitat. Utilizing the simplicity of natural systems will control erosion and encourage indigenous revegetation. Indigenous vegetation systems never need pesticides, herbicides, watering or mowing. They will provide additional canopy layers as they evolve. 21. Regulate Protection: upslope development, with potential alteration of grade elevations, devegetation and altered permeability (pavement, roofs), have the potential to alter the volume, direction and velocity of storm water. Pre-construction review through regulation is necessary to protect adjacent slopes. Wetland resources are often located down slope. note: this publication is intended as a companion booklet, along with- Erosion Control and Storm Water Management: UnderstandingLow Impact Systems and Indigenous Habitat Restoration : Understanding Bio-Engineered VegetationSystems booklets. A good general rule when working on steep slopes is to strictly control vertical access. Layers of indigenous compost, mulch and pine needle/leaf litter are matched to soil horizon profiles on adjacent slope habitat. Sometimes we add a dusting of wood ash if the pH is too low. A measured layer of indigenous mulch will go on top.Indigenous soil profiles welcome indigenous vegetation and connect fragmented habitat.De-vegetation fragments habitat, altering predator/prey relationships. Fragmented habitat may be the single greatest threat to endangered species on Cape Cod.A very thin layer of straw is added directly on top of the indigenous mulch layer, providing temporary moisture absorption and structure. 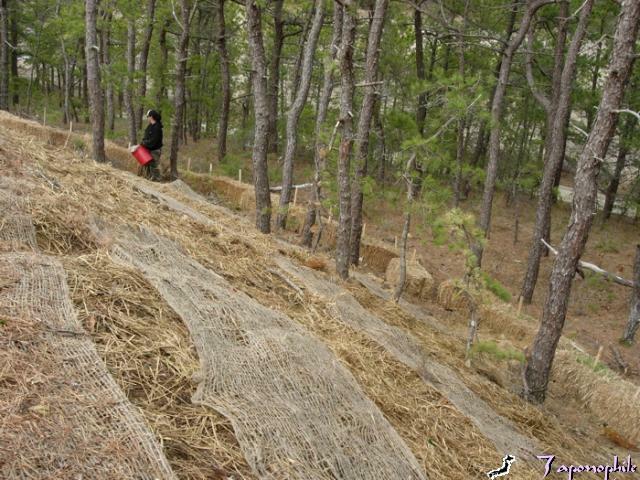 The straw is secured to the slope with stapled jute netting.The pine needle/leaf litter layer over the netting matches adjacent habitat and protects new roots from thermal spikes and moisture loss.The terraces are subtle and understated, tilted back into the slope so gravity will assist with infiltration instead of causing erosion. This system will jump start an otherwise lengthy time line for re-establishment of indigenous habitat. Indigenous vegetation on steep slopes creates a natural stabilization system. Natural re-seeding from adjacent habitat also contributes to stabilization. The few invasives will be discouraged by indigenous pH which limits nutrient availability. We leave invasives during the first growing season, removing them before seed, because we need as much root structure as we can get to enhance slope stability.When slopes are loamed and seeded without gravity breaks (inverted terraces), seeds and loam will end up like this example. 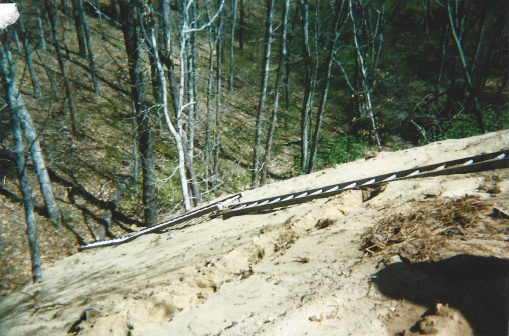 In this example, a steep slope with a wetland down slope, has been eroding due to contributing sheet flow from an upslope parking area. A critical element of slope stabilization includes creating benches or terraces which retain storm water flow and allow it to recharge to ground water instead of eroding down slope into wetlands. Vegetation enhances water retention and will contribute to the removal of pollutants and excess nutrients before runoff infiltrates into the ground water table. Irregularities in surface topography are encouraged to create sub or micro habitats, increasing bio-diversity on the site. Our Ocean and Bayside Bluff stabilization strategies are in the booklet and will be posted here in the near future. On very steep slopes, mistakes generate risk. 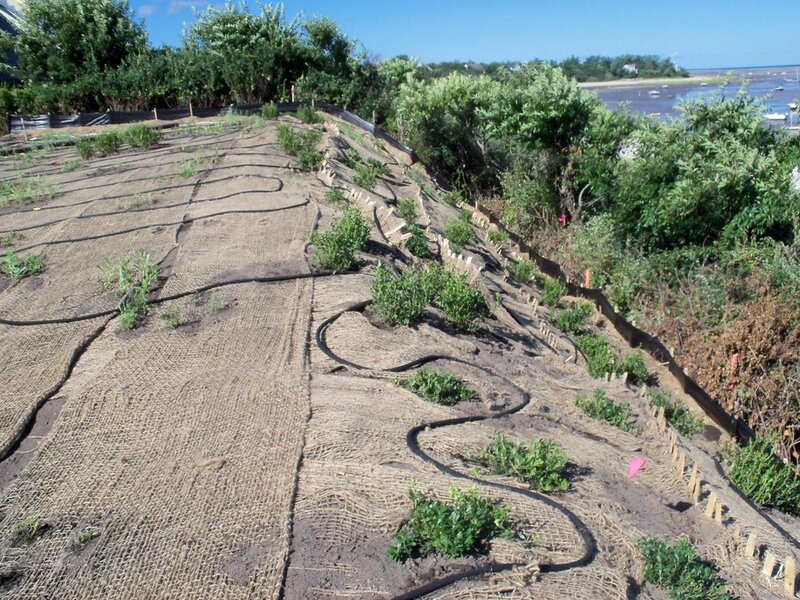 We inherited several layers o risk with a project, on a high elevation dune in Provincetown: first, the topsoil had been removed, exposing the soft sand beneath; second, a very heavy, fiber mat had been staked in over the raw sand, to "secure" the slope; third, the mat was hydro-seeded. When we took over a year later nothing was growing, the slope remained unstable and the very thick mat discouraged germinating grass from establishing roots. We would need to create innovative protocols for removing the very heavy mat, securing the slope and re-establishing a diverse habitat.